Graduating from physical therapy school is a time of excitement tinged with stress. The prospect of autonomous practice, changing clients’ lives, and applying all the hard work from physical therapy school is certainly intoxicating, but the looming clouds of paying back school loans can put a serious damper on any excitement newly minted PTs might feel. With a staggeringly high 85% retention rate and an incredible commitment to fostering new clinicians’ professional growth, new PTs are finding that this niche area of practice offers opportunities for a work-life balance and financial and professional growth they never thought possible at this stage of their careers. Here are some of the ways that FOX is changing how new grad PTs look at their first jobs. Plenty of workplaces will promise mentorship, but few truly deliver structured and effective mentorship programs for new grads. Instead, “mentorship” seems to have evolved into a buzzword that clinics use to attract young PTs and pay them below market rate. Only when hapless new grads are hired do they realize they’ve fallen prey to a bait-and-switch situation. This is not the case with FOX. Slow ramp up period - A true mentorship program allows for a structured ramp up period. New grads are slowly eased into treating more and more independently, and they’re allowed ample time to learn the electronic documentation system. FOX believes that adequate training is key to clinician confidence and patient success. Dedicated mentor - Available anytime by email or phone, a dedicated mentor is provided for each member of the Emerging Professionals Mentor Program. From clinical questions to documentation concerns, and from professional growth questions to considerations about scheduling, the dedicated mentor is a resource on any topic concerning working with FOX. Lasting support - While the Emerging Professionals Mentor Program technically lasts a finite period until a new grad gets his or her feet wet, most clinicians continue to stay in touch with their mentors, asking them questions as they grow professionally, even years after joining the FOX team. And many of these folks develop into mentors themselves, because FOX is passionate about promoting within. One of new grad PTs’ biggest pain points is the inability to take time off. Personally, I missed a close friend’s wedding because I had just started my first PT job and didn’t have the ability to take time off. Frankly, I’m still upset about this, many years later. FOX heavily promotes flexibility and work-life balance for clinicians across the experience level spectrum, enabling clinicians to set their own hours, choose which days to work, and take time off as needed. Some clinicians choose to front-load their weeks, seeing 7-8 clients/day Monday-Thursday, then working a half day on Friday. Other clinicians prefer a steady schedule of clients across the week. Most clinicians choose not to work on weekends, but there’s always the option to work on a Saturday or Sunday in lieu of a weekday, in order to optimize care, accommodate travel, attend special events, or simply a take a day to run errands. With enough notice, a PT’s Regional Director will even arrange necessary coverage, sparing PTs the hassle of coordinating care. In the past, physical therapists had but two career paths: advanced clinical practice or clinic management/ownership. Things are different for PTs today. With a doctoral degree as the standard, physical therapists are seeking more options for professional growth. Clinical advancement - Many PTs crave clinical advancement, and they are motivated by adding professional certifications and specializations to better serve their clients. Leadership opportunities - Some physical therapists wish to advance clinically, but also seek leadership opportunities such as becoming mentors or Regional Directors. Entrepreneurial/business development - Still other PTs wish to move into business development roles. Clinical care is fantastic, but some PTs find that they’re savvy entrepreneurs, and they wish to move into more administrative or creative roles. FOX is a unique practice model that provides robust career growth opportunities for each of these situations. In the past, if a physical therapist wished to focus on non-clinical pursuits, he or she was compelled to create their own career path from scratch. FOX embraces the fact that clinicians sometimes need to try something new, and quite a few of their new graduate hires have moved into business development and/or Regional Director roles. 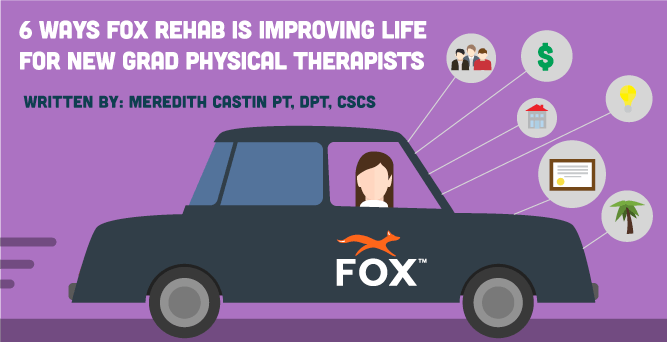 FOX believes that passionate physical therapists provide the best care. For this reason, the practice has a staunch commitment to continuing education for all of its clinical staff members. In addition to providing free access to the MedBridge continuing education platform, FOX also holds frequent educational seminars and courses, in addition to providing a generous tuition and specialization reimbursement program for clinicians who choose to pursue advanced geriatric and neurological certifications. They even assist with reimbursement for speciality certifications, such as LSVT, CEEAA, and others. FOX does not provide these perks without a rationale. Clinicians who are continually learning not only provide better client care, but are also more likely to stay with the practice long-term, a custom readily embraced at FOX. FOX believes happy, well-trained clinicians make good healthcare providers. FOX invests in its clinicians the same way they invest in their clients — with world-class service. FOX makes the effort to keep things simple and streamlined for its clinicians. A case in point is documentation. Personally, I worked for another mobile outpatient PT company for a few months on a per diem basis. I greatly enjoyed the therapy aspect, but my biggest frustration was the fact that I couldn’t access the internet from many of my patients’ homes, so I typically spent excessive time documenting after hours, rather than doing so while I was working with the patient. FOX recognizes that many older adults don’t have internet in their homes and ensures that its clinicians aren’t encumbered as a result. FOX clinicians can receive a Lenovo laptop loaded with applicable software and internet access when needed. Documentation is a critical concern to FOX leadership, which is why standards for such are so high. The practice stresses point of service documentation to help meet these standards, as well as to ensure that clinicians don’t burn out from overwhelming paperwork. New FOX clinicians are trained to make a habit of documenting as they treat, and FOX clinicians and mentors are always available to meet new therapists and assist them with documentation concerns. These may seem like small perks, but they add up. When you’re a new grad and focused on providing clinically excellent care, internet access simply should not be on your mind. As noted above, upon joining a new employer, many new grad PTs are forced to choose between a focus on income. Unlike the newly minted PTs of the past, today’s new grads have crippling student debt to consider when they accept their first jobs. This can mean a troubling choice to prioritize their financial health over their professional growth or learning and patient care over their financial wellness. It’s not an easy decision to make, and one could argue that it’s not really fair. FOX understands this predicament, and it has created an environment where new grads are provided very competitive starting salaries and generous opportunity to advance their compensation. For a hungry new grad eager to pay off student loans, it’s the perfect way to ensure generous pay increases. Curious to learn more about FOX Rehabilitation? You can use the chat bubble on the page to speak with the CovalentCareers PT and OT Success team, who will answer your questions and help provide an unbiased perspective about FOX and if it’s a fit for you. If it seems like a good match, our team will refer you to a FOX Clinical Career Specialist to help you get started in your new career as a FOX clinician. Want to see new FOX Rehabilitation jobs?